Elzinga Punch Cards! We love our customers and appreciate your business. We want to give back to you! 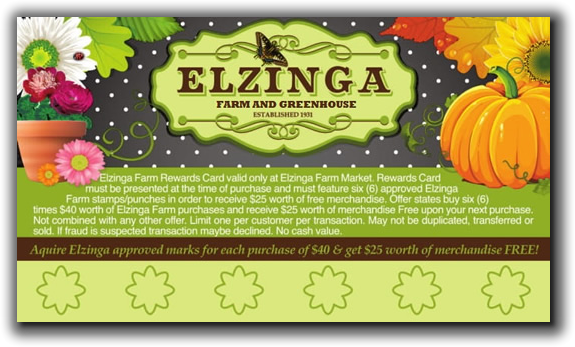 Make sure to get a punch card when making purchases at Elzinga’s. Each time you spend $40.00 (not including tax) on products from us during a visit, we’ll “punch” one of the flowers. When all six are punched, you receive $25.00 off your next visit. The cards don’t expire and can be used for any season. Thank you for being loyal customers of Elzinga Farm & Greenhouse!